The Islanders dropped both of their split squad games last night, with the "A" team losing to Calgary 3-2 in Saskatoon and the "B" Team losing 3-1 to the Flyers. Unfortunately, only the game in Philadelphia could be seen online. Although the feed wasn't the greatest, I was able to see enough to get a good idea of where some players are at. As far as Dwayne Roloson goes, I thought that he looked pretty good. Sure, he may have had some early-game jitters and whatnot, but I thought he settled in nicely and looked sharp to me. When you're talking about a soon-to-be 41 year old goalie, the main thing you want to look for is speed and quickness. He doesn't appear to have lost much, if any yet which means that he can still play at a high level and give us similar play as last year. Jack Hillen played a lot, and the team tried to run some of the offense through him. He played a solid game, and had some good offensive chances. There was one particular play, in the slot where he had a chance that turned out to be a good one, but if he was only a split second quicker. He's one of the players people are looking at to step up during Mark Streit's absence, so naturally many people are going to be watching him closely in these games. Krys Kolanos scored the only Islanders goal. He has always been an excellent scorer at the AHL level, and I would hope the Islanders keep him around for that. Jon Sim and Andy Hilbert will probably be call-ups at various points this season, so it would be good to have a proven vet scorer down there all the time. As far as the Isles' game in Calgary, the best we can go on is what we've read in various reports online. Andrew MacDonald seems to be a guy who shined, playing most of the night with James Wisniewski. Rick DiPietro played two periods and gave up the three goals, but looked OK. He had one bad turnover to give the Flames their 3rd goal. The Isles goals were scored by Calvin deHaan and Trevor Gillies. The most important thing to come out of the night, however, is that everyone remained healthy. The Islanders's next game will be Friday in New Jersey against the Devils, with the team having an off day today. No word on potential line-ups yet. PETROV TRADED IN KHL: Russian prospect Kirill Petrov was traded in the KHL, going from Ak Bars to Yugra. Petrov was consistently a healthy scratch in Ak Bars, seeing as they are a much more veteran-laden team than Yugra. While we won't see Petrov until next season at the earliest, this could possibly be good news as he will now get some more playing time so he can properly develop. It was very frustrating to see what was going on in Ak Bars, and some people wondered if the team was doing it intentionally to make an example out of him. My initial thought of the trade, which sent a 5th-round pick to Ak Bars, was that that it was even more evidence that the KHL was trying to mess him up. But looking at it now, this could be a good move. After all, he signed a contract there, and it is only right to honor it. Hopefully we'll see a better developed Petrov next season. SOURAY ON WAIVERS: There's not much of a story here, but I wanted to address this before more people asked about it. Yes, Sheldon Souray is on waivers once again. No, they won't claim him (if he gets past Columbus, that is). NHL.com writer Brian Compton agrees. The Islanders added Mike Mottau the other day, and that's that. There are eight defensemen on one-way contracts. Save your waiver claim for a forward who could possibly hit waivers (see Ryder, Michael). As the old saying goes, "when it rains, it pours." No, I'm not referring to the weather on the Island lately, but the news surrounding it's only professional sports franchise. The Islanders got even more bad news on Tuesday, as a second opinion on Kyle Okposo's shoulder revealed that he has a torn labrum, which Katie Strang reports will keep the star winger sidelined until December. His injury, like Streit's, will require surgery. Fortunately, the timetable isn't as bad since Streit's was so awkward and had three different injures. What is unclear at this time, however, is what Okposo did to hurt the shoulder. The injury apparently occured during the powerplay scrimmage they had last week Thursday, which was only open to the mainstream media. Whatever the case may be, now the Islanders prepare for three months without their defensive anchor and their best all-around forward. Now, everyone will be holding their collective breaths as the team - finally - begins to play some preseason games. We'll see who steps up now. Obviously, we were already looking for a breakout season from Josh Bailey. Now, we'll sort of need it to happen. A full season of Rob Schremp will be good for us, and given the recent history of talented 1st overall picks, John Tavares can realistically eclipse the 30 goal mark. There are some young players around who might surprise in the exhibition games who could possibly make the squad such as Nino Niederreiter, David Ullstrom and Jesse Joensuu. The Islanders can also look and see who goes on the waiver wire, or who is made avaliable by a team that has no cap space (Michael Ryder of the Bruins, Brian Rolston of the Devils). Garth Snow talked about how this provides an opportunity for the younger players to step up and earn that spot. Ironically, he said the same thing after Mark Streit's injury. Just two days after that announcement, however, he announced the signing of defenseman Mike Mottau to a two-year contract, worth $800K per season. Mottau spent the last three seasons with the Devils. Islanders fans might remember Mottau best for his hit on Frans Nielsen a couple of seasons ago. I sure do, and even voiced my displeasure with it. However, now that that's in the past, I am not too concerned with that. Obviously, he is not Streit. Snow talks about Mottau's puck moving ability, but he is more of a defensive defenseman. The Islanders were not going to come anywhere close to Streit, even if they ended up getting Sheldon Souray instead. I still personally would have liked Souray, but given that the Islanders have no interest, perhaps there is something there, and perhaps his trade demands have truly turned more teams off to him than I originally thought. So be it. Mottau gives the Islanders even more good depth. The offense from the blue line doesn't appear to be there, but it's going to make James Wisniewski, Andrew MacDonald and Jack Hillen step their games up. When you add Mark Eaton, a healthy Radek Martinek and mix and match Bruno Gervais and Milan Jurcina if needed, it's not the worst thing in the world. This defense is collectively better than the defense last year, disregarding Streit. Some people are wondering why they gave him a two year deal. To be honest, in the scheme of things I'm not sure if it really matters. Perhaps it was the only way to get him here. If so, well, this team has Wisniewski, Gervais, Jurcina and Martinek all in their contract years. I think this tells us a little of what they think of Gervais so far, and his order on the depth chart. Jurcina was brought on as a Scott Gordon project, and if he doesn't do well, won't be back. Martinek has had a hard time staying on the ice in recent years, and is a candidate to be let go after the season if he gets hurt again. As far as what else Mottau brings to the team, for those of you who may not know (I honestly didn't) NYI FYI friend Andy Strickland had an excellent entry on his new site about Mottau and things you may not know about him. Some really good stuff there, and shows you how much of a character guy he is to boot. Right now, it appears he's a good option for a lower pairing, but can play more minutes if need be. Before I leave you guys alone for now, I want to give credit where credit is due. When Streit went down with his injury, I mentioned how that the Islanders could send the wrong message if they simply went with a young defenseman and didn't even try to bring in a solid vet to fill the role. I honestly didn't think they would, as they had seven defensemen on one-way deals. But here we are, with Mottau signed and at eight defensemen again. Regardless of the player, or the terms, the Islanders are trying to keep their word. I respect them for that, and am very curious to see if the offense is handled the same way. While everyone waited for updates on the injured Mark Streit and Kyle Okposo, the Islanders made a couple of other roster moves. The team announced that they are bringing Jed Ortmeyer to camp. Ortmeyer had a pretty good year for the San Jose Sharks last season, with 8 goals and 11 assists in 76 games. Ortmeyer has always been known as one of the better penalty killers in the league, as many Islanders fans will remember from his time with the Rangers a few seasons ago. With Richard park gone, that is something the Islanders need. Both Ortmeyer and Dean McAmmond are good pick ups for training camp invites, and many people are hoping they stick on two-way contracts and aren't only here just to fulfill roster requirements. The Islanders improved their 4th line with the addition of Zenon Konopka already, however the amount of quality defensive forwards was still lacking. While it is nice to think about how much toughness the team has added, they can't really afford to play Trevor Gillies and Konopka every night. Some teams will require you to be able to match a good defensive forward against them, and if you bring one or both of Ortmeyer and McAmmond in on two-way deals you can mix and match them along with Andy Hilbert and Jon Sim. The team also announced that they were sending Krill Kabanov back to Moncton. This was clearly the best move for him at this time. Although his chances of making this team were obviously very slim, he ruined those small chances by being late for practice twice in two weeks. The Islanders worked him hard as punishment, and now he will not get to see any preseason action either. I really hope this kid gets act together. The amount of problems that he has had is alarming, but that's the risk you take on. If he does, it's a heck of a 3rd round pick. Hopefully current Moncton head coach and former Islanders assistant coach Danny Flynn can help bring Kabanov along. As of right now, there has been no update as far as Kyle Okposo's second opinion on his shoulder. Once there is an update, I'll be sure to post it here. So be sure to check back for that and any other news, such as other possible invites, as we get closer to finally playing in some exhibition games. I have been a bit slow in putting together my re-cap from the Islanders scrimmage from this past Saturday, and I apologize for that. It is still a work in progress as I try to gather together all the photos and all my thoughts. However, there is some unfortunate news to hit on now, something that came as a result of said scrimmage. Islanders country has been hit hard by the latest word, as Katie Strang of Newsday has reported that Mark Streit will be out of action for six months. If this is true, it is obviously a crushing blow to the squad. I say "if this is true" because the Islanders have not confirmed that this is the case. The Islanders and Streit are going to get a second opinion of the injury, which Strang reports as a torn labrum and rotator cuff that will require surgery. It is also being reported that the blue liner's shoulder was dislocated for close to 20 minutes after the injury. The Isles have been very adamant in their statements thus far, only going as far to say Streit is out indefinitely until they can get that second opinion. If you ask me, I would have to say he is going to be out for six months. Based on what I've heard, the amount of sources saying it - we have to prepare for a season without one of the top-15 defensemen in the league. This would be very bad on so many levels. The obvious one is how this would affect the power play. The Islanders last season, with Streit, finished 27th in that category. They added a bona-fide two-way defenseman in James Wisniewski, who they planned to put on the first unit with Streit. All preseason, the combo looked very good. Now, we wont even have a chance to see it or use it. Another issue here is that this will most likely force one of the Islanders young defenseman to step up their game and prove that they can help the remaining group out. I might be in the minority here, but honestly I have not seen enough out of Calvin de Haan or Travis Hamonic at this time. The have both had their moments, but thinking overall of what I have seen out of both in training camp does not put my mind at ease. De Haan is 19, and really only has one full season of juniors under his belt after suffering a couple of injuries last season. Hamonic needs just a little more seasoning in Bridgeport before he can make the jump to playing with men. Sure, it is very possible that the Islanders can look to bring in a defenseman from outside the organization, but who or what, and for what? The Rangers put Wade Redden on waivers, and that isn't anywhere on their radar. So for those of you thinking about him, be it now or on re-entry waivers, you can forget it. The Islanders won't be doing their rivals any favors. Edmonton's Sheldon Souray is ideal, however there apparently has been no interest in him and I quite frankly do not understand that. He's a defenseman ho has a cap hit of $5.4 million, but for only two seasons. When healthy, he can provide offensive output equivalent of Streit's, and from what I have seen worked on his defensive game a bit over the years. The argument against Souray has people bringing up how no one was willing to pick him up on waivers, so why trade for him? Well, while it's true that no one picked him up on waivers, it is also true that his health has been very unclear. In a league with a salary cap, when so many teams are really close to it, not many are going to pick him up, be it at $5.4 million or half that through re-entry. Many teams are playing with a few hundred thousand dollars to spare, not $2.5 million. You can be sure that Souray would be highly motivated as well, to try and stick it to the Oilers and everyone else who passed on him. Other names that will surface as trade candidates are Florida's Bryan McCabe and Vancouver's Kevin Bieska. Bieska would be a long shot because of the long term injury to Sami Salo. The problem with the trade market is that teams now see the Islanders as a possibly desperate team. If I were an opposing GM, of course I would try to take advantage of this. While the Islanders should really be looking at moves to make, they have to beware of the dreaded knee-jerk reaction. So far, the only move we have seen from the team is bringing in defenseman Anders Eriksson on a tryout basis (along with some others, but more on that later in this entry). Eriksson provides some good depth, but quite simply isn't going to cut it if he makes the team and is relied on for a top-six spot. The Islanders find themselves in a very precarious situation now, and a Streit injury makes their job even tougher. Last week during media day, Charles Wang, Garth Snow and Scott Gordon all spoke of their expectations for the season, and how this is a team that is done with the rebuilding tag and looking to make the playoffs. Snow told us that he has no restrictions standing in his way, and the owner has said that he is more than willing to do what it takes for this team to make the playoffs. But as you can see from that Bob McKenzie tweet, the money on trading for Souray reportedly "doesn't make sense." What's unclear there is if the Islanders simply don't want to help the Oilers out, or the Islanders just aren't willing to spend the money. If it's the latter, then they don't come out looking too good, and many fans responding to this tweet have started to make accusations already. Be that as it may, the Islanders have some options to work with right now. The Islanders still have seven defensemen on one-way contracts, so they can try to mix and match them if need be. Everyone now will have to understand that they need to step their games up to bring the level of the group as a whole up to try and mitigate some of the loss. Wisniewski has talked so much about getting the opportunity to be a first pairing guy on this squad. I bet you he had no idea that he might be coming into the season looked at as the number one defenseman, but I do think he is capable of it. He is the only one who has logged Streit-like minutes, without too many weaknesses exposed while in Anaheim. Mark Eaton logged 20 minutes per game for the Penguins, and Andy MacDonald, who came up from Bridgeport in the middle of last season, found himself playing with Streit and logging 23+ minutes per night by seasons end. MacDonald and Jack Hillen have been playing on the power play in the preseason, and both have looked pretty good. MacDonald appears to have not lost a step from last season, so that is obviously good to see. A sophomore slump from him would not be good at this time, and quite frankly cannot happen. The best thing that we can do is hope that there is some good news on the 2nd opinion. If not, then you just roll with the punches and see what you can work with. I agree with not making a knee-jerk move, and going through camp with what you have. However, if there is a deal to be made, for a late pick, for a guy like Souray and he is as healthy as he claims to be, then it is something that needs to be explored and talked about. The team's chances of making the playoffs could rely on it by seasons end. OKPOSO AILING: Speaking of shoulder injuries, Kyle Okposo has been going through some of his own discomfort. He has sat out the last couple of days, and now the Islanders are going to have him look at an additional specialist on Monday as well. There is some cause for concern here, but it is being overshadowed by the Streit talk. I hope nothing is seriously wrong with Okposo. He was at the scrimmage, watching from the stands and seemed to be in very good spirits, so we'll see what this brings. TRAINING CAMP INVITES: As I mentioned earlier, the Islanders decided that they were going to bring in some training camp invites after all. They have announced that aside from Eriksson, they are bringing in goalies Manny Legace and Joel Martin, and forwards Dean McAmmond and Kris Kolanos. Martin was slated to go to Bridgeport originally. McAmmond played for the Isles in 2009, and I actually liked him in a bottom six role. He'll provide some good depth if he sticks. The thing that makes these moves interesting is the fact that the Islanders needed to dress at least eight vets for each of their split squad preseason games this week, so that obviously played a factor. But I feel that some of these guys can stick on two-way deals. So that's where we stand right now. As I said earlier, I am still working on that recap from the scrimmage with some observations I've had and all that. I'll try and get that up for you guys within the next day or so. The Islanders had a pretty eventful day for their media extravaganza. According to Chris Botta, there were a number of people there and the Islanders put on a good event. I join him in giving a congrats to Kimber Auerbach, Katrina Doell and the rest of the staff. The biggest news of the day was the announcement that the team had signed Nino Niederreiter to his entry-level contract. This is not a surprising move. Many of the top-10 picks had already signed their entry-level deals, but that doesn't mean they have to be in their team's lineups. However, for all the guys that have signed this offseason, it appears as though they will all be given a chance, or at least for nine games to showcase their stuff. For example, it appears as though the Carolina Hurricanes, who signed their own 1st round pick Brett Skinner to his contract as well yesterday, will give him the chance to stick with their club. I'm not sold on the idea that this means that Niederreiter should make the club. He has the size for it, so that is not the issue. Like I said in the post yesterday, he has played OK so far, and there is still a lot more preseason left. Matt Martin has looked really good to me, so on my own personal list I have him penciled in as the guy who's got the early edge. Obviously, we'll have to see what the next couple of weeks bring. My gut tells me to expect Niederreiter here for at least a nine game try-out, which might not necessarily be a bad thing. My only fear is that since he was one of the youngest players in the draft, that it could screw around with his head a bit. The Islanders have not been afraid to put their 1st round picks into the lineup as we saw with Josh Bailey in 2008, and almost saw with Calvin deHaan last season. After practice on Sunday, I had asked Bailey if he talked to Niederreiter, as a fellow first rounder who may not have been a top-two talent but made the jump right away, about his own personal experiences. He had said he only talked to him a little here and there, but not really too much. I would wonder now, with this out of the way, if he does talk a little bit more to Niederreiter. Aside from that, there were some interesting tidbits from the press conference. I'll start with something that I don't plan to talk about much - The Lighthouse Project. Charles Wang stated that he wants to keep the team here, and continues to look for options, but will not leave earlier than 2015. This we sort of knew, however some people speculated that if he were to move the team, then he would do so sooner rather than later. Not the case. While the team may be here until at least 2015, a decision would most likely come within the next three or four years. There needs to be a point where they have to decide in order to give themselves plenty of opportunity to explore and go through with an eventual option. Personally, that's all I have to say on it. I feel that at some point, cooler heads will prevail and this team stays in Nassau. It's been very taxing emotionally to talk about this subject. I know Sean likes to talk about it a lot, and for me I just don't have the heart for it. I'm doing the same thing I've always tried to do, and that's enjoy Islanders hockey. I get to see this team for at least five more years, and that's all I can do. After the meetings, rallies and all the other stuff that I and many other fans took part of, there's not much else we can do, and it is out of our control. I am glad that Wang said that he doesn't plan to be as silent on the subject anymore. Maybe, when something more comes out, I can provide better analysis for you guys. But this is all we really know right now. Scott Gordon is entering his final season as the head coach. It is generally unusual in sports for teams to let coaches go into a final year of a contract, as players can view the coach as a lame duck. I truly feel that this collection of players has the ability to ignore that and still work as hard for Gordon as they always have. The team is talking about taking that next step, and I don't think the coaches contract is in the forefront of any of their minds right now. Gordon doesn't seem phased by any of it, and I have to give him a lot of credit for that. I don't think I would be able to go through with something like that. From what I have seen, there is no reason why Gordon should not be extended. I understand that everyone on this team is talking playoffs, and I am really glad to see it. Obviously, a playoff berth gets him an automatic extension. But some people feel that if they don't make it, Gordon is gone. I don't necessarily agree with that idea, however it really depends on how the year goes. Lets say the Isles have a slightly better year than last year, which shows improvement. Bailey, Kyle Okposo and John Tavares all show improvements. I would think you have to extend him, playoff berth or not. If you don't then you are making a big mistake here. If the team tanks, then sure, that could be another story. This scenario, of course, is based on players staying generally healthy. If any of the key guys go down for extended periods of time, then all of this goes out the window, and it would be a travesty to dump him then. Some people think money is going to play a huge factor in this. To be honest, I don't think it matters. The Islanders hired a coach that, at the time, was the candidate to hire. Other teams that were in the same situation hired excellent coaches from the AHL. Heck, even the Pittsburgh Penguins fired Michel Therrien and replaced him with AHL coach Dan Bylsma. It's just the trend these days. Sure, it's not something that should be overlooked, but despite some things that may (or may not) have happened in the past, I highly doubt a coaching decision will be made based on pay grade. If he provides results (last season was good given what Gordon had to work with) and the players respond and like him (the have and do), then the team would be absolutely insane to not bring him back, and deserve any criticism they would get. Garth Snow said that he has all the resources he needs to be able to still make moves, and he will continue to look for top players if it makes sense for them to do in the long-run. Some people take that to mean that it would have to be someone under contract for a few seasons. But that may not be true. James Wisniewski arrived here with only this season left on his contract. It is very possible, that with Wang's blessing, Snow could add a player, perhaps to help out the offense. Many fans, including this one, have looked towards the Boston Bruins and their situation with Michael Ryder. Ryder had a bit of a sub par year last season for the Bruins (18 goals) but has shown the ability to frequently net 20-25. That is not a bad option for this team, and he has this season at $4 million left. I'm sure there are some other names out there, but I only bring up this one because he seems like the most likely candidate to move elsewhere, and the one who happens to make a lot of sense. KABANOV LATE AGAIN: Kirill Kabanov showed up late for practice again, and an irate Gordon let him hear it in front of everyone. I say, good. This is how he will have to be handled. The Islanders realize this, and have not tried to hide any of it and sweep it under the carpet. It is no secret that Kabanov has had a tumultuous last couple of seasons. While I understand how young he still is, it is disappointing when I see many kids the same age act much more mature. I remember at the draft, him telling us that he was "good like an angel." He looked for cameras to tell everyone how he was going to try his best, and prove to the Islanders how grateful he was that they are giving him a chance. Deb Placey hinted on her Twitter account that Kabanov has one strike left. I don't see it that way. The Islanders wouldn't put him on that short of a leash. Not with that talent. After he was late last week, Snow said that he refused to go into a pitch count for him because they weren't handling it like that. I'm hoping that Kirill gets his head straight, obviously. I don't think this is anywhere near the end for him. He's got a couple of years to develop, and the Islanders will hope that the maturity comes along in those couple of years as well. I'm glad that he's taking all of this in stride, and agrees that he should be getting punished. As he admits, he doesn't have any excuses other than he just screwed up and slept late again. It's all part of the project that is Kirill Kabanov. As some of you have seen from our Twitter account, I was able to go to training camp this past Sunday. While Sean and I had gone on Friday, the players did not do anything on-ice, but had their weigh-ins and fitness tests. We were able to talk with some players, which was nice, but it's much better to go to an actual practice to experience the sights and sounds. I went to the practice with the idea of bringing you extensive coverage, almost in the form of the show "Hard Knocks" (which it appears the Islanders already have in the works, but more on that later), only not as good obviously. My goal was to take videos, pictures and get some quotes. So here we are, 10 videos, 200 pictures and three interviews later. I got there shortly after 9 AM, with the players set to start skating at 9:15. Dwayne Roloson and Mikko Koskinen were already out on the ice facing some shots from the coaching staff. One of the first players that I noticed was Doug Weight. He looked like a completely different player than the one we had been used to seeing. He is absolutely correct in saying that he has plenty of gas left in the tank. This was a great sight to see, because a healthy Weight definitely helps this team. Sure, it's not going to make a monumental difference, but it would be nice to see him get in a lot of games this year. Shortly after all the players assembled on the ice, General Manager Garth Snow came down from the balcony and sat on the top bench in the stands where me and the other bloggers (Tony Stabile of Hockey Independent, Christian Arnold of Islanders Hockey Blog and Gary Harding of Eyes on Isles ) were situated. He gave us all a nod hello, and then proceeded to check his Blackberry frequently. Newsday's Katie Strang arrived shortly after that, and sat next to Snow for a bit. They exchanged some pleasantries, but didn't talk a whole lot. It was at that point, just shortly after 10 AM, when some commotion started up on the deck where some coaches and management were situated. Me and the other bloggers turned to see what was going on. I can tell you that after hearing some rumors over the summer, and not being sure what to believe, I was a little surprised to see Charles Wang and his son arrive to watch the practice. It was the first time that Wang had been around the team in a little while. There were reports out there that said Wang simply didn't care anymore, and had distanced himself from the team. He walked over to where Snow and Strang were, greeted everyone around them and even talked with Strang about how their summers were. The players for the next group were milling around, but most of the ones that I was able to see, when not running around to take photos and video, went over to greet Wang and his son. The biggest greeting came from Rick DiPietro, with the two embracing in a hug and the owner wishing the goaltender a "Happy Birthday." None of the conversations were just your typical simple things. The owner personalized many of the other conversations, asking how players were feeling after suffering injuries, or how their summers went. Trevor Gillies showed a fascination with what game Cameron, Wang's son, was playing on his cell phone. Back to the players on the ice. Rob Schremp looks like he picked up some speed since we last saw him. He told our media scrum after the practice that his knee was feeling much better, and how excited he was that so many players improved their game with the time off. Group two, which was actually named group one (confused yet? ), had more of the higher profile players in it such as John Tavares, Mark Streit, James Wisniewski, Josh Bailey and Nino Niederreiter. Wisniewski led the players of this group in the on-ice stretches, which tells me a little something about what the Islanders expect out of Wisniewski, and what Wisniewski is expecting out of himself. He was genuinely excited about getting the opportunity to further breakout with the Islanders after having a very solid year for the Anaheim Ducks. While you only have access to the audio, I can tell you that in my short time doing this, I haven't seen a player's eyes light up as much as Wisniewski's did when I approached him and asked him about what he thinks about Long Island so far. Wisniewski is in his contract year, and will make $3.25 million this season. I agree that it is not something to worry about right now, but it is something to keep in the back of your mind. This is a guy, however, that I think everyone is going to want to keep around long term after watching him for a few months. Bailey told me after the practice that he gained about eight pounds of muscle in the offseason, and it showed. He's a guy who often goes overlooked when one analyzes the current state of this teams offense (and he may or may not feel that way, but he seemed really thrilled that I specifically seeked him out after practice). For those of you who checked out the two-part podcast from Friday, we discussed the idea that while the teams primary scoring from Tavares and Kyle Okposo needs to come around, the secondary scoring of guys like Comeau, Schremp and Bailey needs to be there. As you can hear from my one-on-one with Josh, he knows what he needs to do and is prepared to do it. I can say that from speaking to him, he seemed very poised to put himself on the map, and in the process help this team along in it's goal to make the playoffs. Niederreiter has looked OK so far to me in camp. As far as the last forward spot goes, I have liked what I've seen out of Matt Martin and David Ullstrom a lot. I don't want to say that anyone has been better or worse than anyone this early in camp, but my early feeling tells me that Niederreiter might not be there just yet. But I have a wait and see approach here because I would like to see some more, and after the scrimmage and a couple of pre-season games see where he stands. One thing I got to do was learn a little bit more about head coach Scott Gordon. While it sounds dumb, people don't realize what a coach is like other than what they see on TV. Some guys have reputations that come from just observing them in that aspect. I can tell you from what I have seen, he is a better teacher than I thought he was. The practice was full of interruptions thanks to the coach and his whistle. If he saw something he didn't like, he blew the whistle and talked about it. You can see some good examples of that in the videos. He spent a lot of time throughout practice talking to prospects Martin, Jesse Joensuu Calvin deHaan and Travis Hamonic. At any rate, those are just some of the observations that I had from my day at camp. I tried to take note of players I am particularly interested in seeing. It's an intruguing battle, especially for that forward spot. Very curious to see if someone separates themselves from the pack, if at all. 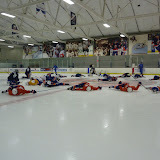 Like I have been saying, I wanted to try and give you guys an inside look of what goes on at Islanders training camp. I took a lot of video. Here are a couple of my favorite ones. The others can be found at our new NYI FYI YouTube channel. I was able to get some audio clips as well. I apologize for the background noise for some of these, but there was an awful lot of commotion going on in the locker rooms. The Schremp interview was part of a large media scrum, but we only give you the ones that I got to ask. The big one was asked by Stabile, and that was about him recovering from the knee injury he suffered near the end of last season. The next time I will get to see this team in action will be Saturday at the scrimmage. I'm not sure how that will work, since this whole thing is a learning process, so I wanted to be sure I gave you all at least one real good up close look at the New York Islanders training camp. I really hope you enjoy the coverage as much as I enjoyed getting it all. As I said, it was a lot of work and I had some technical issues that caused me not to get this up sooner, but better late than never. While it may have not had the feel of a training camp just yet, you could sense the excitement in the air for many of the players at Islanders Ice Works in Syosset on Friday. The players, many of whom have already been at Ice Works skating informally, had to take their physicals and perform off-ice exercises as they prepare for yet another training camp. By the time Sean and I were able to get there this morning, some of the players had already come and gone. However, we were able to catch up with John Tavares, Blake Comeau and Bruno Gervais. All three have interesting story lines surrounding them as we enter camp. For Tavares, the big question is what kind of a follow up he'll have to his overall good rookie season last year. Comeau was on a hot streak until his season was cut short due to a broken foot, and he now has to use the camp in order to find that level of success once again and go into the season with it. Gervais was very up and down last season, and with three new defensemen in the fold, his job got a little tougher. All three are very well aware from these stories and you can hear that in our interviews with them. In lieu of a lengthy post for the training camp primer, Sean and I got together and made a two part, one hour and 30 minute podcast for you guys to listen to. We go through the different battles, speak about many of the players and the stories surrounding them and really focus in on Gervais, Comeau and Tavares and play those interviews for you. As always, these podcasts can be found at our NYI FYI podcast site here. You can even subscribe to our podcasts through iTunes by using the links on the side of the page to be sure you keep up with us as we record shows. For those of you who don't feel like listening to the preview and analysis and are only interested in what the players had to say, then feel free to check out the NYI FYI site and look for the sound bites on the right side of this page. In the Bruno Gervais interview, a couple of questions came from Christian Arnold of Islanders Hockey Blog. He asked some good questions, so we left those in and just wanted to give him a shout out for that. A couple of items of note before we leave you to enjoy all of our coverage from the day. Tonight, the Islanders announced lines for the two training camp squads. These are obviously going to change as we go along with camp, but Scott Gordon seemed to make some very interesting combinations up. I feel that the Mark Streit - James Wisniewski pairing was a very likely scenario, so it is obvious to have them as the top pairing on one of the squads. I'm very curious to see how the Josh Bailey - Frans Nielsen - Nino Niederreiter forward line does. Matt Moulson - Rob Schremp - Kyle Okposo is another very interesting one to keep an eye on as well. As far as injuries go, we are going to have to wait a little longer to see enforcer Zenon Konopka and new defenseman Mark Eaton. Konopka has suffered some lower back issues and has no timetable set for his return, while Eaton has some back spasms and should be able to practice late next week. Let's hope that happens, and that Konopka returns quickly. He was a guy that many players spoke highly of today since he brings an element that the team has lacked for a few years. Looking for ways to expand our coverage for you guys and bring you some extra goodies, we have created a newsletter that you can sign up for on the NYI FYI main website. Sean has been adding a lot to the site over the last couple of weeks, and we are trying to make that the main hub for all things NYI FYI and make it easier to access all of the items we have to offer. So please, definitely check that out and take a look around. That's all we got for now. Tomorrow, with players finally jumping onto the ice I'm sure there is going to be a lot to discuss and analyze and we'll be sure to give you some sort of summary. Enjoy the audio and the podcast! The Islanders dropped the 2nd and final rookie game to the Bruins in overtime by a score of 2-1. Ryan Spooner scored both goals for the Bruins, while Tony Romano scored the lone goal for the Isles. Tonight's effort was much better than the one we saw on Wednesday. Kevin Poulin was in net, and looked very strong. Just like Mikko Koskinen, Poulin has some very quick reaction time. He looked a little quicker with his lateral movement and had the ability to go into the butterfly stance a little quicker that Koskinen, but we could probably chalk that up to Koskinen being five inches taller and very thin. Poulin is at 6'2" and 205 lbs, so he has good size for a goalie. He is very quick with the glove saves, and that seems to be what he is most comfortable with. Calvin de Haan had a better game, but there were still some bumps here and there. The fact that his play improved leads one to think that it is just rust from the lack of playing time, but he is getting there. The Islanders had a lot of powerplay opportunities tonight, and de Haan saw a lot of time from that. It seems like he is very hesitant to shoot the puck. There were a couple of times you could see how much space he was being given from the overhead camera the Bruins were using for the live feed. A good offensive defenseman has to shoot when given that much time and space. He will learn with time, but again you can clearly see he is still trying to shake off some rust. At this point, I'm not expecting de Haan to make the Islanders despite being one of the final cuts last season. He really should spend another year down in juniors to get all of the kinks worked out. Travis Hamonic had a much better game, but was knocked out fairly early after getting into a fight, his 2nd of the tournament which meant a game misconduct. He definitely likes to scrap, and that was good to see. I'm glad he came around and was having a better go at it than he did on Wednesday. I'm very interested to see what he does in the real camp now. For some reason, my recap of game one failed to mention David Ullstrom. I have been pretty impressed with what I have seen from him. This isn't a guy who's going to score a ton, but he has some talent, good speed and a huge frame. A number of times tonight, he could be found screening the opposing net on the powerplay. When he had the puck behind the net, he seemed to be able to cylce back and forth a couple of times and pass it up to create some scoring chances. He's got some really good tools to become a very effective top-9 forward, maybe a top-6 with some luck. I've been excited to see Ullstrom for a little while, and these two games left me even more curious with what we have here. Keep your eyes on him closely during camp in the battle for the open forward spot. Justin DiBennedetto has some good skills as well. He's not the most skilled guy, and the probability that the skill he has shown translates into a regular top-6 in the NHL is slim, but he looked a lot better than what I saw last year. He's faster, smarter and much more "chippy." I like what he is trying to do with his game and how he is trying to change is. That could go a long way in making him an effective player and a contributor at the pro level. Nino Niederreiter is a very strong kid. He has an excellent ability to be able to turn his back to a defender when he's carrying the puck, which enabled the Isles to set up shop in the offensive zone a few times tonight. He got knocked down a couple of times, but he's still trying to get his "NHL legs." He'll be in camp, and an obvious favorite to make the club for at least the first nine games of the season. If Niederreiter sticks to the game we saw him play in these two, he should have no problems. What will be interesting to see now is how he fares going up against even bigger, faster and stronger opponents in the NHL camp. If he doesn't have the same success, he won't take long to adjust. He has the size which gives him an advantage over many other young players, and the hockey sense to be able to make some adjustments on the fly. Kirill Kabanov was doing much of the same as he did last night. The kid can be an offensive dynamo one day. It's a shame that he is so light, because he could really do a lot more if he were only about 10-15 pounds heavier. Perhaps after another season in junior he can become a contributor with the Isles, but he is on the right track skill wise. Hopefully he matures so that we can be sure that we'll definitely have the skill here, in North America. Finally, Mark Katic had a very strong series. I didn't mention him Wednesday night either, but he showed quickness and a good offensive game. He has definitely gotten significantly bigger since the Islanders took him in the 3rd round in 2007, and playing in Bridgeport last season seems to have taught him a lot. He likes to jump in on offense, but he's very smart with knowing when to pick his spots. Twice I saw him get himself into trouble on pinches, and both times he was able to use his speed to get back. Both times he didn't put himself totally out of position either though, and that surely played a factor. Good to see that we could possibly have a little more offense coming up the ranks on the blueline. These are only a few of the guys who had strong games, but they are the ones that people had the most interest in given their skill level and draft positions. It was nice to see some generally good performances from some of the Isles top young talent, and now we get to see how some of it will translate in the NHL camp. The Islanders Rookies dropped the first of the two meetings against the Bruins Rookies on Wednesday, losing 5-2. The Isles got their goals from Nino Niederreiter and Robin Figren. The team looked very shaky for much of the game. Some of you who were tracking the analysis on Twitter tonight may have already seen some of my comments. Specifically, I called out Calvin de Haan for his performance tonight. One has to remember, though, that this was essentially his first game in a number of months after suffering a season ending should injury which required surgery in January. When you take a step back and think about that, it was sure nice to see him back on the ice. He is a very good defenseman, which one can see from his selection to represent Canada at the World Juniors. However, there were at least two instances tonight where he tried going for the poke check only to have a Bruins forward easily skate around him. Once he gets his feel for the game back, this will hopefully be a much rarer occurrence. Mikko Koskinen was a standout for the Isles for much of the night. He looked strong early on, and despite issues controlling rebounds, was able to keep things close thanks to his quickness. He playes a stand-up style and does not seem to flop around much, which is probably best for a 6'7" netminder. Koskinen is still returning from a lengthy injury of his own that he suffered last season, when he had to have surgery on his hip, and miss most of the AHL season. Upon his return, he played a handful of games down in the ECHL before returning to Bridgeport for the playoffs. What I saw from Koskinen tonight left me confident considering how little hockey he's played in the past year. I think a lot of the things that a goalie usually lacks after a layoff like that, such as the quickness, were there. The rebound control is something that a player with his skill can work on and rectify quickly, so I'm not too worried there. Kirill Kabanov has a ton of skill, and it showed on the powerplay. While there wasn't much to show on offense for the Isles tonight, Kabanov made some nifty moves and was very slick. He has an amazing ability to keep the puck on his stick for stretches, and is very fast with his decision making. Some of his defensive plays weren't anything to write home about, and I know some people were pointing that out. In all honesty, he's billed as a kid who oozes offense - that's his game. There are a ton of players in this organization who are great two-way players. There aren't many, however, who posses the offensive ability that Kabanov does. We can splurge a little. After his little mishap on the first day of camp, he worked extra hard on day two and even stayed after for some "punishment sprints." The hard work showed tonight, and I hope that's the only message the Isles have to send him. If he gets his head in order (keep in mind how young he still is), then we will be in for a treat. Travis Hamonic was OK, but nothing special. This is a guy billed as an excellent shut-down defenseman, but tonight he seemed a bit hesitant. He did get into one fight, which quickly turned into a wrestling match with both players stumbling to the ice. We hear so much of Hamonic laying out big hits and I personally didn't see him play the body as much as I would have liked. When taking a look at everyone, I tried to keep in mind a couple of factors. The injuries that some of the players we're battling was one of them. aside from that, the rookies practiced for two days then jumped on the bus to get to Boston. Also, there were a couple of players on the Boston squad who spent time in the pro's last season, more than many of the Isles prospects. I think all of that played a factor as well. At the very least, it was good to watch hockey again. I was hoping for a better effort, but these guys are all so young and still trying to get back into the swing of things. The guys that people are paying close attention to all did some good things, with some mixing in some not so good things. But that's what this is for. The hope is that this is a tune up for them for the big camp starting Friday. The Isles and Bruins go at it again Thursday night. Just like Wednesday, expect there to be a feed on the Bruins and Isles web site. Expect a different lineup as well. Correction: Ullstrom last played for HV71, not Linkoping. Thanks to reader Magnus for the tip. When the Islanders took Kirill Kabanov in the 3rd round back in June at the entry draft, everyone knew the risks. They understood why the kid fell from a sure fire top-three pick in the preseason rankings. I even described all the trials and tribulations the young Kabanov went through over the past couple of seasons. Despite talking about how much he has to change, and how he will work his hardest to make the Islanders as soon as possible to show how much he appreciates that they took a chance on him, Kabanov has gotten off on the wrong foot. Kabanov was not allowed to participate in the on-ice drills in day one due to disciplinary actions handed down by the team after he showed up late for team physicals. I give the Islanders a lot of credit here. They could have very easily looked at this situation and swept it under the rug, but they know exactly what they are dealing with. Punishing Kabanov is exactly what should happen given his history. The hope obviously is that by doing that, you show how serious you are and let him know that just because he is as skilled as the top players in the draft, he will not be handed anything. I feel one of the best quotes regarding the situation came from Scott Gordon. When asked by Newsday's Mike Rose if he was disappointed about Kabanov not participating, Gordon simply replied "not as disappointed as he's going to be." He would go on to say that this was something that the Isles "talked to him about and he's got to learn to follow the rules." One thing the fans have learned about Gordon in his two years here is that he doesn't put up with things like this. He isn't afraid to mix lines up to get others going or bench guys who are struggling mightily. Some people have disagreed with the way the Isles handled this today, but in my eyes they did exactly what they had to do. Kabanov has to step up and show he wants it if he truly wants to prove everyone wrong. While we have to wait another day to see Kabanov, the other prospects took part in the long practice. There was a lot of coaching from Gordon, and by all accounts it had the feel of a clinic. Some of these young players will be with the big club next week, including 5th overall pick Nino Niederreiter. Niederreiter admitted that he had some trouble early on, but by the end of the practice felt more comfortable. It's good that he picked up on the system rather quickly because as Chris Botta says in his interview with Gordon, Nino's chances of making this team for at least the first nine games is very good. Niederreiter, who just turned 18 last week and was one of the youngest players available in the draft, is already a big kid at 6'3" and 202 pounds, so he absolutely has the size needed to be able to go through the rigors of the NHL season. The only concern there would be conditioning and skill level. It is best not to rush prospects along, but the Islanders have enough developing young players, many of whom are poised for breakout seasons, where they can play Niederreiter in a 3rd line/power play role to start off and not have to worry about putting too much pressure on him immediately. Time will tell what will happen, but it is best for all parties if Niederreiter gets through the camp and impresses. It will put a great deal of confidence in him and the coaching staff, and things could only go up from there. Another prospect that I was looking forward to hearing from was forward David Ullstrom. After the two-hour practice, he said that he felt content with the way he performed. Ullstrom is a guy I have been intrigued with since the Islanders took him in the 4th round of 2008. He's a big kid with some good skills to boot. Last season in Sweden, he was able to put up 5-11-16 in 47 games for Linkoping, which are actually good numbers for a 20 year old. For many of the leagues overseas, developing prospects is not anywhere near the top of their list. For him to be able to stick with the big club all year, and put up those points in very limited minutes is really promising. I think that he is somewhat of a diamond in the rough, and I feel there is a very good shot we'll see him by seasons end. The Islanders have been looking to add a forward, but seeing as they have not up until this point, they will look at some of these young players. Size is something they are always in need of, so even if it's later in the season, we will get a look at Ullstrom at some point. The team will return on the ice for the 2nd day tomorrow. Hopefully we'll have some updates on some of the other players. A few that are of interest are Kabanov, Calvin de Haan, Travis Hamonic and Casey Cizikas. For many players, training camp is the same song and dance. However, when the Islanders open up camp on September 17th, there will be something that they haven't been used to in quite some time - a healthy Rick DiPietro. 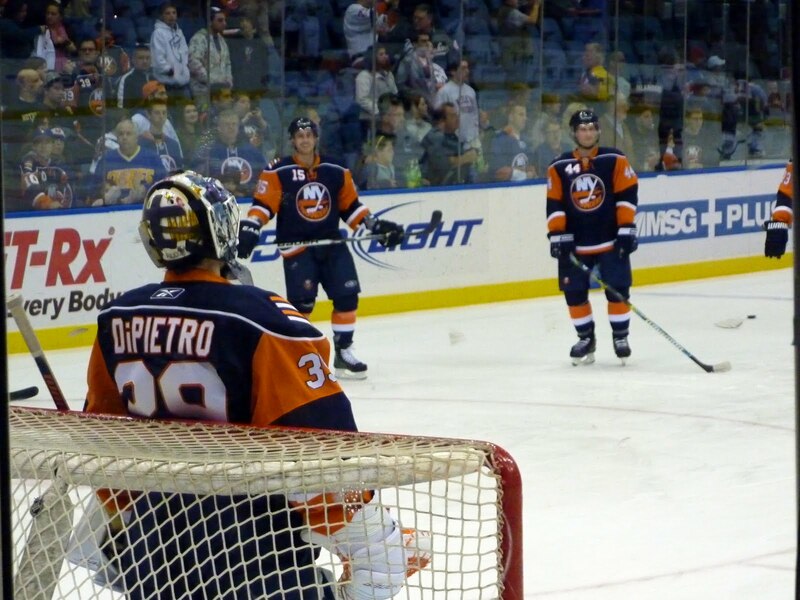 For the last month, I’ve heard nothing but positivity about the health of Rick DiPietro. This is wonderful news for the Islanders, their fans and a 29-year-old man with several years potentially ahead of him to do what he loves best. This is also in stark contrast to what I was hearing at this time last year, when the Islanders jumped through hoops to deny my August, 2009 report that DiPietro still had a long way to go to get 100% healthy and play a lot of NHL games. It goes without saying that this is good news. Obviously, one should proceed with caution when it comes to DiPietro and his progress. As Botta points out though, there is a stark contrast. Personally, I will feel 100% about all this when I see what happens after the year. I think most people would agree. We learned the hard way that this won't be easy. There were a couple of times last season where DiPietro talked about being much better, and he still only got to play in eight games. If we go on the assumption that DiPietro gets through training camp and is healthy, then it creates a perfect storm for the playoff hopeful Islanders. Dwayne Roloson, the incumbent in net, will turn 41 during the 1st week of the season. Roli held up fairly well in 50 games last season after a rough start, but many wonder how much longer his body will hold up with the amount of playing time that comes with being a starter. What Roli has going for him is that he hasn't been an NHL starter his entire career, and as he claims, he has less wear and tear on his body. Should Roli not be able to take on that much work, a healthy DiPietro would be huge. If you figure he can play in 35ish games, then not only does it keep Roli fresh, but it also eases DiPietro back into the starter role, which he could take back after Roloson's contract expires at seasons end. I wouldn't expect more from DiPietro than that this season. If he is able to play more, then it is a bonus. Nathan Lawson is an unknown, and was very good at the AHL level - he won rookie of the year in 2008-2009 - but for a team striving for the playoffs, I'm not sure many people are too confident in having him be the regular backup, which could be an unfair statement. Regardless, the Islanders didn't bring in another goalie this offseason because: 1) They don't need another situation to arise like what happened last year, with disgruntled players at the deadline when both Roli and Martin Biron were still on the team and 2) because DiPietro does appear to be healthy. Let's hope it stays that way, for our sake and his. NEW LOOK COMING: Expect a little different look to the blog shortly. I have been toying around with different designs, and am still trying to finalize things and see what makes sense and looks nice. If you happen to visit us and the site is down, you'll know why. Just bear with us though and we'll have it all worked out in the end. DOUG WEIGHT RE-SIGNS: The Islanders and captain Doug Weight finally closed the deal, as the center agreed to a one-year contract for $875K. There are $300K in bonuses in the contract that can bring the total up to as much as $1.15 million. Many people had their doubts about wanting Weight back, but when he ended his season early in order to get the much needed surgery on the torn labrum and rotator cuff that he injured in November you should have known that he was thinking about continuing to play. Doug still has some left in the tank, so why not? He has said that he is recovering very well and should be able to participate in training camp, and has also said he is feeling the best he has since he came to the Islanders in 2008. What I find interesting is that he says the shoulder has been nagging him over the last few seasons, especially since he joined the team. In that first season here, while battling groin issues as well, Weight was still able to go 10-28-38 in just 53 games, and was pretty effective as a powerplay quarterback. We already know about all the intangibles he provides, but I'm curious to see what a much healthier Weight can provide offensively this year. Some folks seem to think that Weight will get the benefit of the doubt, and get ice time that he may not deserve. Last season, there were various players who had their ice time cut in favor of younger players when it was warranted. Scott Gordon isn't afraid to do what he has to in order to make this team perform at it's best. He is in his contract year, and the goal for this season is playoffs. Doug won't be among the leaders in 5-on-5 ice time, but you can bet he'll be near the top when it comes to powerplay time. SIM AND HILBERT RETURN: The Islanders brought back a couple of former Islanders when they inked Jon Sim and Andy Hilbert to one-year deals. Sim just finished the final year of the three year contract that he signed with the Islanders prior to the 2007-08 season. After having a rather tumultuous first two seasons, Sim was actually not too bad in his agitator role last season, and it isn't even a guarantee that he makes the roster this year seeing as he has a two-way contract. When he had his AHL stint in 2009 after being waived by the big club, he got 23 points in 18 games. The Sound Tigers have lost some fire power and leadership down there, so it is a welcome addition for them. He is not a terrible option to have when players go down with injury or if a game requires the Isles to add a last minute "pest." Hilbert left the Isles after the 2008-09 season, signing with the Minnesota Wild. Hilbert, who only saw four games in the NHL last season, signed a two-way contract as well. Hilbert was a guy who always did fairly well on the penalty kill, and is another guy who isn't a terrible option on the fourth line. As is the case with Sim, this is another welcome addition to Bridgeport as he had 25 points in 33 games with the Houston Aeros last season. TRAINING CAMP INVITES: As we rapidly approach the start of training camp, we have not yet received any word on the Islanders having any confirmed players for training camp yet. A couple of weeks ago, USA Today's Kevin Allen reported that the Islanders had reached out to agents with UFA's and said that they would welcome players for try outs. This is not a bad strategy, especially for a team at this point in the rebuild. The pickings are extremely slim now, and some of the only decent options that are out there have opted to go overseas. But there could still be some good finds, such as Fredrik Modin (Edit: Modin is reportedly signing with the Atlanta Thrashers) or Marek Svatos. Whether or not those two would be willing to accept invites is another story. Many people seem to think there is an excellent chance we'll see one or more of Mark Parrish, Miroslav Satan or Ruslan Fedotenko in camp this year. All three former Islanders enjoyed their time here, and Parrish and Satan were training at Iceworks in Syosset as recently as last season, when there were on and off rumors of the Islanders signing them. The Islanders did end up bringing Parrish back on a minor league deal a couple of seasons ago, but that didn't last long as he was signed by the Dallas Stars for the remainder of that season. Satan ended up signing mid way through last season with the Boston Bruins. The Islanders are no strangers to training camp invites, and actually signed most of the guys they brought in. In 2006-07, both Mike Dunham and Richard Park found their way onto the club through invites, while the 2007-08 squad picked up Bryan Berard. We are at the point now where we start to hear about guys attending camps on invites, so we'll definitely keep our eyes open for any news. BERGIE AND MEYER MOVE ON: A couple of weeks back there was a run on teams signing former Islander fan favorites, with Sean Bergenheim signing with the Tampa Bay Lightning and Freddy Meyer signing with the Atlanta Thrashers. Bergenheim got a 1-year deal at $700K, and gets to join a team that is much improved this offseason. He and the Islanders were at a crossroads after last season, and the team felt that it was best to part ways with the often inconsistent winger. Many people expected better offensive production out of Bergenheim, but he was generally solid defensively. However, there were times he would get into ruts where he would struggle in all aspects of the game and take some bad penalties on top of that. There were points where it seemed that he was over thinking the game and what he was doing. Now, he walks into a situation in Tampa that is probably better suited for him since he will not be looked at to be a primary source of offense. Freddy Meyer got a 1-year, 2-way deal from the Thrashers. After loosing Andy Sutton at the trade deadline last season, Meyer became one of the Islanders better defensemen. He would often throw some punishing hits and blocked a lot of shots too. He was a guy who I was hoping would return for some depth, but with the Isles bringing in 3 new defensemen it sort of spelled the end for Meyer. He'll provide some good depth for Atlanta. We'd like to wish these two fan favorites the best, and look forward to seeing them with their new teams this season. GORING REPLACES JAFFE: MSG Network announced that current in-game analyst Butch Goring will be sliding into Billy Jaffe's old role along side Howie Rose as color commentator. This should come as no surprise. In the post I made a couple of weeks back about Jaffe leaving, I mentioned that Goring was going to be a top candidate. I'm very curious to see how Goring does in his new role. Jaffe did an excellent job, and provided some great insight into games. He was frequently on the national TV broadcasts, and I would imagine he still will be. Jaffe has not said what he plans to do next, but someone is going to get one hell of a broadcasting talent. I hope to be able to watch many of the national games and have Jaffe there, breaking down the plays like a coach just like he did for the past four years during Islanders games. Good luck to him in whatever he decides to do next. Those are the updates that I have been wanting to give you guys for the last little while. Most of the important stuff is now covered. Right now, I'm working on a couple of pieces talking about the Kovalchuk decision and the new amendment to the CBA, as well as some posts on the makeup of the Isles as we head to camp. As I said, I'm going to start pumping out these posts so be sure to look for them. Well, I know that it's been a while since the last post here. However, much has gone on, especially over the past two weeks or so. I figure given these recent events, now is a good time to give you guys a post with a special announcement to catch up since things are moving along fast and furious with training camps just around the corner. I am proud to tell you all that I have been selected to be an official member of the New York Islanders Blog Box for the upcoming season (yes, I know my name is spelled wrong in the article but we'll ignore that for now). Needless to say, this is a dream come true. Just to give you all some background, Sean and I have been wanting to become re-affiliated with the team in some capacity. As some of you may remember, we used to have our podcasts taken and put up on IslandersTV for everyone around the world to see back during the 2007-2008 season. In June, the Islanders presented the opportunity for new bloggers to try out, and I decided to throw my hat in the ring on behalf of NYI FYI. The audition was to go to the draft party on June 25th and use every resource available and paint a picture for the readers. For those of you who might have missed it, this was what I was able to come up with. When the Islanders first announced their plans to have a Blog Box back in 2007, I created this blog with the idea of trying to join that. But at the same time, Sean approached me about doing the radio show, and all the time and resources we had went to planning and preparing for the shows. The blog had been put on the back burner for a bit. When I started blogging again, I never thought that I would be able to take it this far. The show has been pretty good for us, as we gained our own little cult of followers and were able to get some big name people come on the air with us over the last few seasons such as Steve Mears, Chris Botta and Kevin Allen. One thing that I have always been grateful for was the support and help I've had from people along the way. Obviously, a key person in all of this is Sean. He fully supported trying to get NYI FYI re-affiliated with the Islanders and has really helped to make things successful so far. When he created the idea for a show way back when, I bet he didn't expect to go through what we have so far. Obviously, I appreciate the fact that Katrina Doell and the New York Islanders thought enough of my audition and interview to select me for this opportunity. I hope to be able to provide some extended coverage for a sport that gets some unfair treatment. One thing I understand is that many people don't seem to have the best feelings about bloggers, and some go as far as to constantly voice their displeasure in how they get grouped along with writers. Well, this is a sport that much of the main-stream media fails to recognize, which honestly is their loss. Over time, the Islanders have been able to shape the Blog Box into something reputable, something that I am proud to be a part of. I was able to develop my writing skills over the last couple of years, which is something that I feel will be valuable when trying to provide the best coverage possible. A friend from school, Michael Kelly (who now writes for the Amsterdam Recorder), got me into journalism, which is something that has quickly become a hobby of mine. He encouraged me to write for the Stony Brook Independent, which is an on-campus news organization (they do an excellent job and still have some very good talent running the show there, so I encourage you to look them up). It was there where I learned most of what I know now as I was able to dabble in general campus news and sports. Mike will help me out with this blog from time to time, taking care of some editing and helping out with some html things since I can get a bit technologically challenged. So a big shout out to him for the help and support. So where to from here? Well, there have been some recent news stories that I haven't covered, and my next post plans to touch upon all of that. We are just coming to end of the slow point in the offseason and players are now starting to gear up for training camp. The Islanders are going to have camp back on Long Island this season, so of course I'm sure there will be plenty of items to discuss as the camp rolls along. It's very exciting to have camp back here for the first time in many years, and some of the practices are going to be open to the public and for those of you who can check some of them out, I recommend you do. There is going to be some great competition for some spots on the team this year. In the meantime, I encourage you guys to take a look around at some of the links that we have on the blog. For those of you who are new, please be sure to follow us on Twitter and Facebook. If you have anything questions or comments, you can e-mail us. So there is a little update for you guys. I'm currently working on that post with the quick hit of updates from the past couple of weeks. As I said, now that we're at the beginning of September you can expect the amount of coverage to pick up again so please be sure to visit often and feel free to leave your comments.